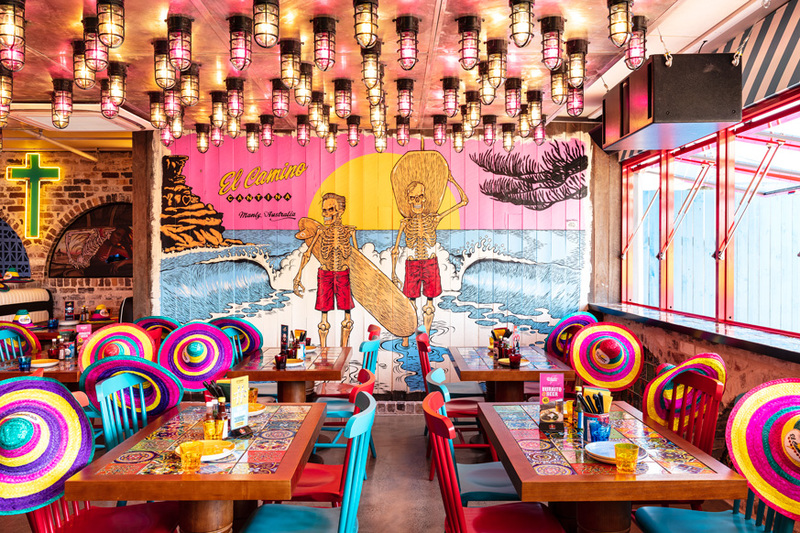 When the team from El Camino Cantina announced they were bringing their legendary Tex-Mex, famous frozen margaritas, and sombrero-splashed party vibes to Manly, we rejoiced with a collective, “Si”! Having already created several ‘Skeletons Driving Muscle Cars’ pieces for El Camino in The Rocks, Ben Brown was brought in again, this time to install an Endless Summer inspired ‘Skeletons in the Surf’ style mural. The result is bright, bold and mind blowing, the likes of which the Northern Beaches has never seen. In fact, we reckon this 365-seat restaurant (with a dining terrace overlooking Manly Wharf, no less) is going to add some much-needed spice to Manly’s night life. Arriba!